Created for industry, by industry, CITT compresses over 50 years of real-world experience and innumerate hours of logistics experience into its case-based professional course of study which is developed, updated and facilitated by successful, proven logistics practitioners. The CCLP designation is proof its holder has met CITT's industry-based, widely-respected, and nationally-recognized standard of expert-ability. Thousands of progressive companies on the shipper, carrier and ancillary services sides of business trust CITT to accelerate their peoples' learning curves, protect their supply chain stability and capabilities, and create a framework for ongoing professional development. And thousands of CITT-Certified Logistics Professionals (CCLPs) have maintained their designation over the years—bringing distinction and competitive abilities to themselves and their companies. committed to follow CITT's Code of Professional Ethics. Click here to learn more about the full requirements to earn the CCLP designation, or click here to learn about the ongoing professional development and commitment to the CITT Code of Professional Ethics required to maintain the CCLP designation. They might describe themselves as "CITT-Certified Logistics Professionals"
The complexity of the supply chain & logistics business is increasing and people with proven abilities give their companies a distinct competitive edge. The demand for qualified staff is quickly outstripping available supply and this is worsening as the boomer exodus starts. People understand that a designation program can help them get smarter, faster and that a designation is the surest way to boost their earning power, advancement potential and access to other career enhancements. CITT is viewed as industry's most experienced, trusted and valued credentialing organization offering the most comprehensive designation based on a deep understanding of the business of supply chain logistics. Thousands of organizations across all commercial sectors have, or have had, employees who are at various stages of professional development and/or full certification with CITT. The CCLP designation is an ideal credential for anyone who buys, sells or manages the flow of goods or product—or is impacted by supply chain logistics. CITT develops, deepens and demonstrates the abilities of the dedicated specialists in the supply chain logistics sector often called the "Carriers". Almost all of Canada's major ports, leading transportation companies representing every mode, vertically integrated 3/4PLs and many ancillary service providers have student and credential holders from CITT. CITT also develops the supply chain and logistics abilities of people who work for companies the sector calls "Shippers". CITT's designation supports manufacturers, retailers, import-exporters, and other organizations that ship goods, resources or raw materials. We support those who handle their logistics in-house, as well as those who outsource and procure services from specialized providers. Whatever the economic climate, it's always wise to invest in your people for short-term compete-ability as well as longer survive-ability. We know we need to home-grow more talent since there are fewer experienced professionals available to attract from competitive companies now that the Boomers are starting to retire. Companies just can't develop the up and comers fast enough. We also know supply chain and logistics, no matter what new technologies are there to help us, is a people-rich business. Our people make or break our profit-ability—especially when we're running lean. People with a breadth and depth of specialized logistics and management ability can find opportunities, protect our companies from risk and can differentiate our firms with customers on the basis of their expertise. Click here to learn more about the employer benefits, payback and ROI of hiring CITT-Certified Logistics Professionals and/or supporting current staff to take CITT courses and earn the CCLP designation. Proven logistics expertise has compelling impact on key KPIs. A CCLP designation develops and demonstrates abilities. And abilities drive performance. 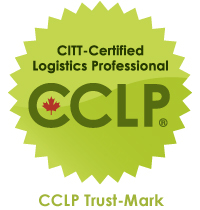 The CCLP designation from CITT provides the kind of ability-building companies need to run profitable, invulnerable and sustainable supply chain logistics operations. And the CCLP designation is proof its holder has met CITT's industry-based, widely-respected, and nationally-recognizded standard of expert-ability. Having depth and breadth of specialized logistics knowledge is the key to predicting and maneuvering through the Great Disruptions that strike our global and domestic supply chain logistics ecosystems. CITT focuses on developing and deepening people's management abilities and equipping them with a sound understanding of integrated logistics and its component parts. Course work needed for the CCLP designation is case-based and helps people design and operate responsive, integrated systems within cross-functional supply chain and logistics environments to deliver maximum value to all stakeholders while minimizing exposure to service interruptions. The last technical course people take in the program—Integrated Logistics—challenges their ability to understand, align and integrate all internal and external supply chain logistics functions into one cohesive system. These functions can include production planning, procurement, materials management and handling, quality control, inventory control and order processing, warehousing, data exchange, finance, transportation and customer service. When you know more and have a respected credential to prove it, you're worth more professionally. A designation from CITT has been proven to significantly boost people's earning power, career prospects and other, available professional enhancements. What's more people with professional designations are more likely to keep their jobs in tough economic times, or are more competitively positioned when looking for work.6 Click here to learn more about the benefits, outcomes and ROI for professionals who hold the CCLP designation. CCLP is the most affordable supply chain designation/program and has the best ROI in the business. Click here to learn more about how to earn the CCLP designation.